Last Tuesday i met Mark at Mission Bowling Club, 3176 17th St, between Shotwell and South Van Ness. It’s been open for over a month now, and neither of us had managed to fit in a visit. It’s Anthony Myint’s fifth food adventure: Mission Street Food (a popup that started in a taco truck and then moved into Lung Shan one day a week but shut down so he could do Mission Burger three days a week inside Duc Loi with Danny Bowein, and then closing that so he could do Commonwealth. Then backing Mission Chinese Food at Lung Shan (which was more Danny Bowein’s show until Danny was lured off to New York), and now Mission Bowling Club. Here’s Alex Hochman‘s review, and he vies with Patty Untermann for a fine combination of entertaining writing and accurate assessments. Mark’s scooter wouldn’t start when he set out for the restaurant, but luckily by drawing on motorcycle experience acquired during my misspent youth, i was able to give him a tip that worked. While i waited, i had great fun talking with Michelle, the delightful hostess, while i sipped a St. Bernardus dubbel from Belgium. Nice bartender, too, as was the waitress later. We were seated on the mezzanine, where the tables give delightful views out over the bar and the bowling lanes. Quite a fun vibe in the place owing to the happy bowlers, but Mark and i were not there for the bowling but rather Myint’s food. Both of us had planned to have the Mission Burger, Myint’s legendary creation at Mission Street Food that won every burger award in the city during its short reign. But then we looked more closely at the menu. Oh my. To help us decide, we ordered beers from their excellent list, and this time i tried the La Chouffe, a Belgian pale ale that contrasted dramatically with the dark St. Bernardus in every way but the alcohol content, and i was already pleasantly buzzed from the St. Bernardus. But not too buzzed to engage in a spirited negotiation with Mark over the menu. 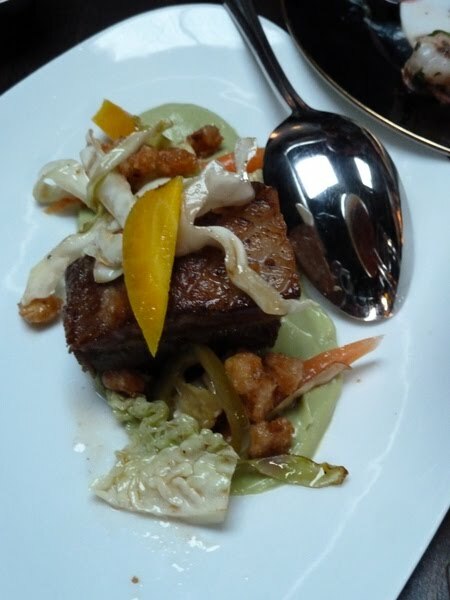 We settled on splitting everything: a superb ceviche that we were both too hungry to photograph followed by the Crispy Pork Belly with avocado, hominy, cabbage, pickled carrot, and jalapeño. 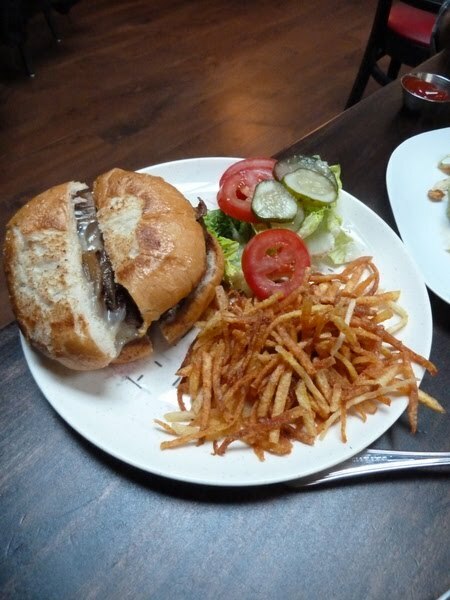 The Mission Burger, which is even better than the Deluxe Burger at Pearl’s Deluxe. There is no higher praise. 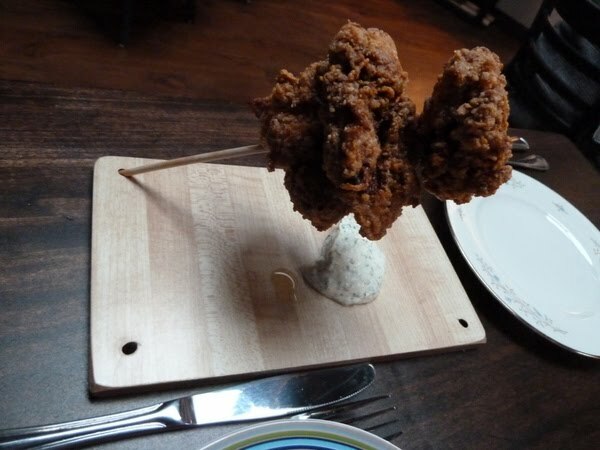 And then, just to demonstrate that we were real foodies marching to our own deep fryer, for dessert we had the fried chicken, almost presented to death but every bite as delicious as everything else. The actual dessert was riding home on the Segway as darkness fell, without my lights, quite drunk (for me) on two Belgian beers. Such an adrenaline rush that i was almost sober by the time i got back here.